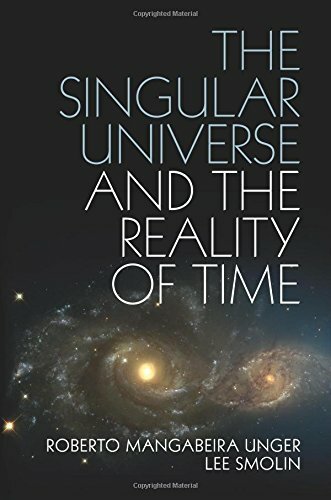 I have devoted a serious amount of time to reading the new book by Roberto Mangabeira Unger and Lee Smolin, The Singular Universe and the Reality of Time: A Proposal In Natural Philosophy . Indeed, this review actually pertains to the first part of the book, written by Unger, the philosopher in the pair. Eventually I will come back to it with a second review, focusing on the part written by Smolin, the physicist. They make the same argument, but one goes at it from a broad, philosophical perspective, the other from a more empirical, scientific point of view. It is an ambitious book, bound to be controversial both among philosophers and among scientists, but it is worth the effort, if nothing else in order to expose one’s mind to a fairly radical way of conceiving of metaphysics, physics, and mathematics — and this despite the fact that the first part, written by Unger, is somewhat slow going and repetitious, compared to Smolin’s contribution. Before we get to what the authors set out to accomplish, it is worth discussing a more basic premise of the book: they see it as an exercise in what they call (a revived form of) “natural philosophy.” Of course, natural philosophy was the name by which science went before it became a field of inquiry independent of philosophy itself. Descartes, Galileo, Newton and even Darwin thought of themselves as natural philosophers (the word scientist, in fact, was invented by Darwin’s mentor, William Whewell, in 1833 ). But what’s the point of going back to the old term, aside from a bit of historical nostalgia and perhaps intellectual pretentiousness? Actually, Unger & Smolin (henceforth, U&S) make a very good case for it, which begins with the observation that many of their colleagues have indeed engaged, often stealthily, or perhaps without recognizing it, in precisely this sort of activity. You may have noticed over the last several years the appearance of a number of books written by scientists and allegedly aimed at the general public, but upon closer inspection turn out to be a bit like those recent delightful Disney and Pixar movies: two-track productions, with the obvious and most accessible one aimed at young audiences, interwoven with more sophisticated jokes that only the cognoscenti (i.e., the adults, as far as the movies are concerned) understand and enjoy. These exercises in natural philosophy, according to U&S, have been written by scientists who want to talk not just to a lay audience, but also to their colleagues, outside of the strict and constraining formalism of peer review. Think of such books as long op-ed pieces that scientists (partly) aim at each other in order to influence the agendas of their respective fields. This strikes me as exactly right, and makes new sense of a number of books I have read (and perhaps of some I have written?) over the years. For instance, I can count as exemplars of this new genre: Peter Woit’s Not Even Wrong (on string theory ); The Mating Mind, by Geoffrey Miller (on human sexual selection ); Capital in the Twenty-First Century, by Thomas Piketty (on economics ); Guns, Germs, and Steel, by Jared Diamond (on social evolution ); The Plausibility of Life, by Marc Kirschner and John Gerhart (on the evolution of evolutionary theory ), among many, many others. Indeed, arguably the approach goes all the way back to Darwin’s own Origin of Species, which had the distinction of being written for other naturalists, and yet selling out with the general public within the first day of distribution. Let us be clear that U&S (as well as myself) do not for a moment think that the scientists in question are doing anything unsavory, or engaging in a duplicitous advertising campaign. On the contrary, what the authors wish to do is to make the trend clear and take advantage of it to push their own agenda about physics and cosmology. I find the whole idea quite refreshing, regardless of whether one ends up agreeing or not with U&S’s specific proposals. I think Unger is being a bit optimistic about the possibility of not “depending on metaphysical ideas outside or above science,” but in other parts of his contribution to the book he seems to be arguing for a more modest (and eminently achievable) aim: to highlight a science’s (inevitable?) metaphysical commitments and to reduce them to the bare and justifiable minimum. All of the above taken as a preamble, what is it, exactly, that U&S are arguing for, and on what basis? Here I will draw heavily on the introduction to the book, common to both Unger’s and Smolin’s separate contributions, and I will intersperse my commentary as I see fit. All I have to say, pace my friend Sean Carroll and a number of other physicists and cosmologists: amen! U&S explain that there is no particular scientific reason to believe in the multiverse, that the idea is empirically untestable and therefore not scientific (yes, they are aware of claims to the contrary, and they deal with them), and that the whole concept is a metaphysical (in a bad sense of the word) cover up for what they see as the current failure of cosmological models. They explain that this conviction comes out of taking seriously what they consider (rightly, I think) cosmology’s most fundamental discovery of the 20th century: that the universe has an age. This discovery, they argue, is incompatible with the oft-repeated idea that time is relative and that there is no privileged absolute measure of it. Before you throw general relativity at me, consider that these two know what they are talking about. They are perfectly aware of Einstein’s theory, and they deal with it accordingly, philosophically in the first part of the book, scientifically in the second one. They do not reject GR, they simply reject what they think are unwarranted metaphysical extrapolations of it that physicists have taken for granted but that can be challenged in light of the empirical data coming out of cosmology. Interestingly, in other domains of physics it is the physicists themselves who gladly follow U&S’s advice. Take, for instance, the emergent phenomenon of phase transitions . It turns out that the curves describing transitions between states of matter are the same regardless of the specifics of the substance, indicating a universal phenomenon underlying these processes. Moreover, by far the best (though, crucially, not the only) mathematical treatment of phase transitions invokes, you guessed it, singularities! That is, the mathematical physicist works things out as if the number of molecules involved in phase transitions was infinite, which allows him to deploy some very elegant and very treatable mathematical formalisms to describe the physics. But of course everyone knows that this is just an idealization: number of molecules is never an infinite quantity, only a very very large one. Why then, make a metaphysical 180 in the specific case of the Big Bang? I think Einstein himself would have appreciated a bit more deference to the empirical here. And now to the issue of laws of nature. The whole idea has a controversial history , and is of surprisingly recent vintage. Among early natural philosophers, Descartes, and then Newton, were enthusiastic supporters of the notion, which of course they directly ascribed to the existence of a creator God: after all, if there are Laws, we need a Law-giver of some sort. Hobbes and Galileo, on the contrary, were distinctly unexcited by it, preferring instead to talk about empirical approximations and generalizations. While the Cartesian-Newtonian camp holds sway in modern physics, a number of philosophers before U&S have pointed out that this is likely a mistake, introducing an enigma (where do the laws come from?) in order to explain a mystery (some observed regularities in the way the universe works). Two such philosophers are Nancy Cartwright and Ian Hacking. They independently published two seminal books on the topic back in 1983: How the Laws of Physics Lie (how’s that for a controversial title? ) and Representing and Intervening , respectively. According to Cartwright in particular, laws of nature are not true generalized descriptions of the behavior of particles, say, but rather statements about how particles would behave according to idealized models. Her crucial point being that theories are to be re-interpreted as (empirical), idealized models of reality, not as more or less isomorphic (true) maps of the world. Cartwright distinguishes between fundamental and phenomenological laws: fundamental laws are those postulated by realists, and they (supposedly) describe the true deep structure of the universe; phenomenological laws, conversely, can be used to make predictions, they work well enough, but they are strictly speaking, false. Newtonian mechanics is then interpreted as a phenomenological law: it is an idealization that works well for certain practical purposes. Crucially, for Cartwright, all laws are like that (so she is an anti-realist about laws), which means that in physics, instead of looking for a fundamental “theory of everything” we should be working instead on putting together a coherent patchwork of local (phenomenological) theories and laws, each characterized by a limited domain of application. Here is how she puts it: “neither quantum nor classical theories are sufficient on their own for providing accurate descriptions of the phenomena in their domain. Some situations require quantum descriptions, some classical and some a mix of both.” To say something along the lines of “yes, but in principle we could use quantum mechanics for everything” is, according to Cartwright, to go beyond the empirical and wade into shaky metaphysical ground. While Unger and Smolin don’t quite go that far, the spirit of their criticism is similar. Interestingly, however, they derive it from an analysis of physical laws that begins with another staple of philosophical discourse: causality . But, wait, I’m sure you are about to say, isn’t it the case that we have lots of empirical evidence that time changes depending on local conditions, such as the speed at which we move, or gravitational effects? Unger (and Smolin, in the second half of the book) have obviously considered this: “No necessary, one-to-one relation exists between the Einsteinian-Riemannian ontology and the hard empirical content of general relativity. We can keep the empirical residue while dispensing with the ontology.” (p. 232) The practical solution here is to conceive of absolute time not in terms of standard units, such as seconds, oscillations of reference atoms, and the like. Time is, if I understand U&S correctly, simply the succession of causal connections between events. This succession can locally take place at a different pace, but this does not invalidate the universally true fact that certain things (like, most obviously, the Big Bang) happened before (meaning that they were causally antecedent to) others. There are two crucial consequences of this way of looking at things: to begin with, that the laws of nature themselves can change over “time.” Indeed, they already have. U&S think that the universe has gone through at the least two phases, and possibly many more before those. One phase was the Big Bang and what happened immediately before and after. During this sequence of causal events (i.e., “time”) things were happening that did not abide to anything like the predictable regularity we see operating today, because the causal processes themselves were changing. The second phase is the one of the cooled down universe, which has gone on for billions of years now, and which can (to a good approximation, as Cartwright would say) be described as law-abiding, because the nature of the causal interactions that characterize it is either not changing or not changing appreciably. But this state of affairs may not last forever, and the universe may go through yet another period of upheaval, and so on and so forth, indefinitely. The second crucial consequence is that physicists should take cosmology seriously as a fundamentally historical science, to be modeled after some of the “special” sciences like geology and biology, not in the increasingly singular way in which fundamental physics proceeds. Indeed, the idea that the very regularities governing the universe change with the causal conditions appears odd only in fundamental physics, because it has been so influenced by abstract (and necessarily time invariant!) mathematics. All other sciences have long recognized the emergence of new patterns of behavior (i.e., new regularities) triggered by changed causal conditions. For instance, major transitions in biological evolution (e.g., from unicellular to multicellular life) have made possible entirely new modes of evolutionary change (a concept known as “evolvability” ) that were simply not instantiated before. The appearance of sentient beings capable of reasoning has triggered novel types of causal interactions described by the social sciences (psychology, sociology, history, economics), again following patterns that were simply not accessible to the universe before a certain point. This yields an appealing picture of open possibilities, where the future is not fixed by the past, but depends on how causality will change and on what novel forms it will take. “the relational approach to nature and the priority of becoming over being. … The relational idea is that we should understand time and space as orderings of events or phenomena rather than as entities in themselves. … In the history of physics and of natural philosophy the two chief statements of the relational view have been those formulated by Gottfried Leibniz in the late seventeenth century and by Ernst Mach in the late nineteenth century. … A second philosophical inspiration of this book is less easy to associate with a single doctrine, a ready-made description, or a few names. It is the tradition of thought that affirms the primacy of becoming over being, of process over structure, and therefore as well of time over space. It insists on the impermanence of everything that exists.” (pp. xiii-xv) Well, in terms of names at the least, I may suggest Heraclitus and Fu Hsi (the author of the I Ching, the aptly named “book of changes”). These are, of course, far from uncontroversial ideas, but they are eminently defensible philosophical frameworks: time and space are not entities, but ways to order events, and the universe is not organized according to timeless (ah!) laws, but any regularity that characterizes it emerges from the unfolding of things. The Singular Universe and the Reality of Time: A Proposal in Natural Philosophy, by R.M. Unger and L. Smolin, Cambridge University Press, 2014. Not Even Wrong: The Failure of String Theory and the Search for Unity in Physical Law, by P. Woit, Basic Books, 2006. The Mating Mind: How Sexual Choice Shaped the Evolution of Human Nature, by G. Miller, Doubleday, 2000. Capital in the Twenty-First Century, by T. Piketty, Belknap Press, 2014. Guns, Germs, and Steel: The Fates of Human Societies, by J. Diamond, W. W. Norton & Company, 1999. The Plausibility of Life: Resolving Darwin’s Dilemma, by M.W. Kirschner and J.C. Gerhart, Yale University Press, 2005. On mathematical Platonism, by M. Pigliucci, Rationally Speaking, 14 September 2012. But then see: Mathematical Universe? I ain’t convinced, by M. Pigliucci, 11 December 2013. The Unreasonable Effectiveness of Mathematics in the Natural Sciences, by E. Wigner, Communications in Pure and Applied Mathematics, vol. 13, No. I (February 1960). Then again, see for instance this rebuttal by Steven French: The Reasonable Effectiveness of Mathematics: Partial Structures and the Application of Group Theory to Physics, Synthese 125:103-120, 2000. Platonism in the Philosophy of Mathematics, by Ø. Linnebo, Stanford Encyclopedia of Philosophy. Essays on emergence, by M. Pigliucci, part I, part III and part IV, Rationally Speaking, 11 October 2012, 22 October 2012, and 25 October 2012. Are there natural laws?, by M. Pigliucci, Rationally Speaking, 3 October 2013. How the Laws of Physics Lie, by N. Cartwright, Oxford University Press, 1983. Representing and Intervening: Introductory Topics in the Philosophy of Natural Science, by I. Hacking, Cambridge University Press, 1983. Causal Processes, by P. Dowe, Stanford Encyclopedia of Philosophy. Is evolvability evolvable?, by M. Pigliucci, Nature Reviews Genetics 9:75-82 (2008). Good review. Look forward to the follow-up. I’m not familiar with Unger, although I have read about him and am impressed. Smolin I have read and listened to; I remain open, though uncommitted, to his speculations. I must say, though, that I like that when he engages metaphysics, he admits he is doings so, which so few physicists practicing metaphysics seem willing to do. I wondered whether or not to get involved in the discussion over mathematical Platonism. Right now the matter lacks clarity. The problem seems to be that there appear to be two variants. One is well known to philosophy, originating roughly with Frege (with a precedent in Kant), and developing through Quine and others, as part explanation of the foundation of mathematics. This has three legs, of which two seem well-grounded, but the third seems little discussed: that mathematical objects ought to exist prior to/ without rational thought processes. Apparently philosophers don’t know the failure of this principle would mean; since, I take it, mathematical objects occur in the minds of many people, and can do so without recapitulation of any initial process generating them. But I frankly don’t see what it would mean for the principle to succeed. Objects in the mind have their own reality, and the processes of realizing these objects is not to different person to person, especially as concerns abstractions. That two persons in similar cultures with similar knowledge bases can independently construct calculus at roughly the same time, is not at all mysterious, nor need we explain this as somehow having to do with the existence of some ‘ur-calculus’ prior to the thought processes that actually did develop it. At any rate, these processes appear to be ‘all in our heads.’ My guess is that mathematics is constructed through inference, recognizing and developing implications, invention when confronted with novel problems, etc. – pretty ordinary human thought processes. The other variant of mathematical Platonism, now largely identified with Tegmark, is that mathematical forms are to be found in the physical universe itself. Not simply the relationships we measure and organize theoretically with mathematics, but the math itself. This really does seem to approach the mystical, and is certainly a metaphysical claim. As far as I can see, it has no clear explanation of how these immaterial forms express themselves into the physical world in which we actually live. Without such explanation, it can only be an assertion – ‘science makes me believe nature must be modeled this way’ – as if science had a will of its own, and nature an ability to theorize itself. It should be noted that when pete1187 denies the physicality of the world, because matter is the result of atomic activity taking place in space, he doesn’t seem to get that ‘the physical’ is a reference to this result, and that whatever happens at the atomic or subatomic or quantum levels are physical in that it produces this result. Therefore, we are looking for explanations of the processes that can lead from the quantum to the rock on which I stub my toe. An alternative metaphysics that cannot account for the physics that so far has more or less successfully explained those processes, is an idealism without a foundation. In a recent debate with a strict incompatibilist over on Niel Rickert’s blog The Heretical Philosopher https://nwrickert.wordpress.com/2015/03/19/notes-on-free-will/, I found myself up against someone who refused to admit he was engaged in philosophic dispute. Strict determinism, he claimed, was a ‘fact’ that had been revealed empirically by science, that ‘everything’ acted accordingly, without engaging in metaphysics. I tried to point out that this ‘everything’ is what classical metaphysics refers to as ‘being,’ that his brand of determinism was thus an ontological claim, and I remarked some of the problems with empiricism as an epistemology reliant on inductive logic. But it was hopeless. Apparently some believe that the sciences they engage in are in direct communication with god, even when they don’t believe god exists. I also don’t believe god exists, and so I don’t really see how we could get a direct line into a divine mind that doesn’t exist. I’m perfectly happy relying on imperfect sciences and reasoning to provide guidance on certain matters – exactly because they are imperfect. Being imperfect myself, I feel comforted knowing we all are. No. Mathematical formulas only govern the human practice of mathematics, in the effort to understand physical phenomena. AFAIK, the universe doesn’t care about them. On a similar principle, I must disagree with Marko on one point: “Due to consistency, the second patch-law must then become reducible to the extended-first-patch law.” Well, but if the universe doesn’t want to acknowledge our insistence on consistency, what are we going to do? Its a good explanation, and if it works, all right; but the universe is dumb and mute as to what laws we want to impose on it. Laws are simply regularities. The universe may be less regular than we suppose. With Marko, I don’t see that there is any more reason to assume that the mathematics of the Shing would be any similar to our own, than that their language would be like ours. We see the world through human eyes. We frequently mistake our constructs as ultimate. I’m not saying you are doing that; but while math is shared among us, the Shing may have other ideas…. PA: Exactly. With a little help from philosopher Karl Popper. Entanglement has been experimentally shown to not be localizable with the metric used in General Relativity. So light quanta themselves not only are not points, something that was obvious all along, sorry Einstein, but also, the speed of light is an emerging metric for the Universe. If mathematics is inable to deal with temporal asymmetries, the why are there so many perfectly mathematical equations describing temporally asymmetric phenomena? Patrick, it’s not that mathematics cannot “deal” with asymmetries. It is that such asymmetries have to be imported as external conditions, as the equations themselves are symmetrical. You could say that math doesn’t care about (temporal) asymmetries, but it deals with if need be. > It is that such asymmetries have to be imported as external conditions. I still don’t get it, and I don’t think reading the book will help. You can do with mathematics anything you want in this regard. It happens to be so that the “fundamental” laws of physics are (mainly) time-symmetrical. But there’s absolutely nothing in mathematics that forbids them to be asymmetrical. If by some accident of history the fundamental laws would have been asymmetrical, then symmetry would have to be justified in certain circumstances. It’s not that mathematics can deal with temporal asymmetry “if need be”. Time is just a parameter T in an equation – one of the many parameters. Sometimes the equation is invariant under T –> -T, sometimes it isn’t. From the point of view of mathematics, it’s a purely formal property (with important consequences for the solutions of the equation). One might say that mathematics is so good at its abstraction from the particularities of the world, that it is intrinsically neutral towards temporal symmetry or asymmetry. If temporal (a)symmetry is a physical or philosophical problem, don’t blame mathematics! Richard Benish Thanks for correcting my inaccuracy in working from memory on Wheeler’s riff on GR. I don’t think it changes my larger analogy much, which ToT ran with in his second comment, shortly after my first. Massimo, Thanks for your response. I find that more understandable indeed. I find it “quasi-convincing.” I understand, and find the relational idea pretty convincing, if that’s what they mean, but I’m still not sure it fully addresses ToT’s concern about multiple uses of the word “time.” Marko brings up some of the same issus. At the same time, I’m not sure any one definition has to be called “meta-time.” After all, “space” is used with several different definitions, and we don’t call one particular view “meta-space.” That said, I have no problems with an ordinary language-type multiple uses of the word “time” where warranted, as long as we are clear, in cases of doubt, which use is meant. And, I see no need to buy into “mathematical Platonism” in general. Per Massimo’s first RS link, all sorts of things are “abstract,” but we (at least I) don’t conceive of a Platonic quality called “abstractness.” Otherwise, I see mathematics, specifically postulates, etc., in the same light as laws of physics. To put it in terms of an early paragraph of Massimo’s second RS piece, these fundamental postulates are no more and no less ontological than Planck’s constant, Boyle’s law, field equations, or whatever. Per Massimo’s second comment to various people, the book I recommended in my first comment has simple, base-level explanations of both many-worlds and multiverses, and their problems, in everyday terms. And, per Phillip What if the computer is running on, say, Windoze 3.1? Or Windoze 7 built entirely out of kludges on Windoze 3.1? Such analogies give too much credit to computers, first of all, and second, re discussions about consciousness and free will, extend the territory to which we should analogize computer operations wayyyy too far, in my opinion. Robin This is part of larger issues, many at least tentatively connected to the Drake equation. I am with Tipler, Barrow and others that most estimates of the variables are way too high. I’m also with Paul Davies that most SETI seekers, in the use of the Drake equation and in general, are still too anthropomorphic. Re Massimo and Marko on various topics related to Cartwright. To go quasi-Gödelian, or informally Gödelian, can we even have a “theory of everything”? Massimo, at least, I’d like to hear your thoughts on that. The issue of time-dependence of laws of physics can be described as follows. Suppose you have a law of physics, and it makes a prediction that in one week an event A will happen. This is then a theorem in our formal theory (containing that law of physics). However, somewhere between now and one week in the future, that law of physics may (abruptly or gradually) cease to be valid. So after a week, the theorem of our formal system no longer holds. Standard math is terribly inefficient at expressing the above situation. The sentence like “modus ponens is true today but will not be true tomorrow” is not quite easy to express using standard math, and not something we are used to. Moreover, there is a social problem of indoctrination by standard math — some people are in outright denial about the possibility for a sentence like that to make sense at all. Nevertheless, in daily life we regularly deal with such statements. A statement “I am hungry” may be fully true now, while completely false tomorrow, as long as there is no moment in time when it is simultaneously true and false (which would amount to a contradiction). What is sometimes not so intuitive is that the statement about modus ponens is in no way different from the statement about me being hungry, from the perspective of a formal system. Or at least it should not be treated differently by the formalism. But standard math is not really well suited to express this, because all math statements are mapped into a binary set “true/false”, and their truth-value doesn’t depend on time in any natural way. Of course, there are alternatives to standard math. These problems are addressed by formal systems of temporal logic, probabilistic logic, and similar. These logics contain expressive power that standard logic lacks, because they extend the set of sentence truth-values from “true/false” to something like “1/4 true until 3pm tomorrow” and such. Some variant of a temporal logic would be more suitable to describing time-varying laws of nature. The real issue, however, is that these alternative logical systems are being studied only at the level of logical formalism itself. I don’t know of any attempts to build the rest of the math on top of such a logic. Things like set theory, arithmetics, geometry, algebra, analysis, etc… So the formalism is not developed enough to provide physicists with any calculational tools (which will intrinsically be time-dependent themselves). On a global scale GR allows a time-reversal violator (non-conservation of energy) as pointed out by Sean Carroll and many others. Eric Linder has described this in terms of gravity having two opposing directions: Locally inward (attraction) and globally outward (accelerated expansion). The local side of this schizoid behavior is exemplified by the standard prediction for the result of Galileo’s experiment: A test mass dropped into a hole through a larger body harmonically oscillates. A video of the motion looks the same whether played forward or backward. Unfortunately, we don’t know whether this prediction is correct or not, because nobody has done the experiment. In the course of building GR, Einstein used an analogy whereby the non-Euclidian geometry needed to represent gravitational spacetime curvature is likened to the non-Euclidean geometry implied by uniform rotation. From this analogy Einstein deduced that rotating observers should think of themselves as being at rest. If this is true it would indicate (1) We’ve discovered a local manifestation of lopsided time. And (2) gravity has only one direction: outward. In any case, the idea can be tested by performing Galileo’s experiment. If the outward acceleration indicated by accelerometers attached to gravitating bodies reflects the physical truth of the matter, then the test mass will not pass the center of the body it falls into. A video of the motion would be patently irreversible (not true in the backward direction). I think it is fair to say that the vast bulk of the book being discussed here and the discussion itself are far removed from physical experience. They appear rather as an unresolvable muddle of conflicting abstractions. Meanwhile, the Reality of Time may be asserting itself right under our real physical noses by the Un-Singular outwardness of gravity. The confused state of physics and cosmology might be inevitable if we knew for a fact that the result of Galileo’s experiment would confirm the standard prediction. To make sure we are properly framing the problem, however, we need to behave like good scientists and look under all unturned stones—or at least the really big ones. This means testing GR where it has not yet been tested, inside matter. It means testing the as yet untested assumption that we have correctly conceived the local direction of gravity. Why not replace our assumptions with facts by doing the experiment (Small Low-Energy Non-Collider) whose result would yield an unequivocal answer, a crystal clear answer directly from Nature? Not to be repetitive, but math is about describing order. For some, order is logically all encompassing and so it seems natural to assume math/order is foundational to nature and if we just keep building it, eventually we will find all the pieces, but the facts mitigate otherwise. Which leads to the next point, that order has to be finite, because what is unbounded can’t be fully defined, yet nature has an obnoxious habit of being infinite and always adding more. Usually in the gaps and weaknesses in our models. Which then leads to the next point, that order is static, as definition is formalization. While nature tends to be dynamic. So it is a bit like water, always seeking the holes in the vessel. Given the above, order is reductionistic and so, by definition, is incomplete. Now if we were to simply accept math for what it is, an abstraction of the ordered aspects of nature and not keep insisting on this religious totalitarianism, that math is nature and nature is math, there would be less confusion. More light and less heat. If it is a law, there will be no ‘somewhere …’. If there is ‘somewhere …’, just show us ONE-where as a solid example. Modus ponens is not a logic law, let alone to be a law of physics. Without a single example, your statement will be totally meaningless. One, there is an arrow-of-time (as reality). Any symmetrical equation which floats in this time-arrow-flow (TAF) describes the phenomena of moving in an asymmetrical direction. The asymmetry of phenomena arise from the asymmetry of boundary conditions in TAF. The asymmetry of the mid-level physics laws is also the result of the same mechanism. Two, arrow-of-time (asymmetry) is the EMERGENT of timelessness (symmetry). The entire KEY is right here. As soon as this process is done, this universe is asymmetrical while the symmetric equations are floating in this asymmetrical time-flow. Discussing the ESSENCE of time without addressing the above issues is simply wrong, totally irrelevant. In fact, in order to solve any of the above, the ESSENCE (TTAP) of the time must be known. The following two are good cut-in points. Whenever someone talks about the reality of time, a sceptic would be inclined to ask which clock is being considered? Why pick a particular clock? Time varies according to which device is being referenced. The essence of a clock is that it has a predictable periodicity (an oscillator); chaotic change per se does not present an element of time, except for an outside time-aware observer who would subjectively conclude that her time is being wasted. Earth’s rotation is by far the most important clock for us. The regular cycle of day and night has profoundly affected living creatures, almost all exhibiting circadian rhythms due to their internal biological clocks – yes, even some bacteria have a circadian protein molecular clock that regulates their gene expression. There is also a seasonal clock governing reproductive cycles, etc. Each organism has internal oscillators that keep track of time and anticipate environmental changes. Anticipation seems to be of great adaptive value all across the biological spectrum. Of course, in addition to the original, primitive mechanical clocks and sun-dials, we now have ultra-accurate quantum and atomic clocks. But there could be more: light waves have very predictable frequencies. They have little built-in clocks, it would seem. I am venturing into completely foreign territory here, but could all the semantic and conceptual confusion reigning in physics be related to the possibility that they have been unable to measure photonics time, or apply the appropriate measure of time? Time as a concept does exist and has great influence on human affairs. So do love, hate, envy, beauty, etc. These are all powerful ideas that must be respected. They just are not real by my definition of the word. So I agree that inflation is an interesting toy-model, it may yet show up in future data, but let’s not oversell that power spectrum picture. It’s much better than that. We can look back at CMB predictions, based on the inflationary model, that were published before any of the satellites (COBE, WMAP, Planck) were launched. As one example, take Bond & Efstathiou 1987. The subsequent data have shown such predictions to be amazing right, and certainly vastly better than any predictions from non-inflationary scenarios. Thus inflation has had proven predictive power, which is the “gold standard” form of evidence. You are right that *eternal* inflation variants are not *directly* verified. The point there is that inflation models that *don’t* produce eternal inflation don’t work. Of course all this is, as ever, provisional. It may be that someone might produce a non-inflationary cosmology that works better, or a non-eternal, non-multiverse variant of inflation that works better. But, at the current time, multiverse inflation is what the evidence we have points to, it’s what works best and what gives the best explanatory and predictive power about cosmological observations, especially the CMB. Thus, on entirely proper scientific grounds, it is the current front runner. I’m puzzled by your mathematical Platonism. If the type of “existence” of mathematical structures doesn’t have any attributes or properties associated with that “existence”, in particular, if “they” are “causally inert”, then isn’t applying the term “exists” to them quite literally meaningless? It’s a label that amounts to nothing at all. Indeed, to me, having zero causal capability is a pretty good definition of “doesn’t exist”. So why argue for mathematical Platonism when it has no content or meaning? As for Big Bang Theory; Given the patches required to sustain it, such as inflation and dark energy, when does it get put back in the speculative category? Never, because there is too much evidence for it (though it might get superseded by a better variant of the idea). … which is the contraction of intragalactic space. … how does the universe as a whole expand? Because the natural behaviour of “space” is to either expand or contract, but not to stay static. No, it is very carefully and thoroughly investigated and critiqued by the physics community. … but as a philosopher, your job is not threatened by looking at it more closely. Nor is that of any cosmologist. Have looked up Hilbert Space, admittedly only on Wikipedia, and it is not even an astrophysical theory but (in a very important sense ‘merely’) a mathematical generalisation. Yes, I realise that multiple universes from eternal inflation are also disconnected from ours, but still this seems like a big difference. It is one thing to say: it is very probable that other universes have been generated through the process that generated ours, but a totally different one to say: our universe is copied a fantastillion times per second, totally for free, because of several possible interpretations of this set of observations it is my favoured one. Unless inflation turns out to be wrong, the first one is no more indefensible than the claim that there might be life on other planets. We already know that life can arise because we have seen our example, and we already know that a universe can be produced for the same reason, but we do not know that it can be copied. In fact everything else we know from physics should speak against it. At least you are willing to contest my observations. Thank you. The reason Einstein added the cosmological constant is because he thought gravity would collapse the universe and as far as I can tell, galaxies are fairly strong gravitational vortices. Remember the black holes in the center? So is or isn’t gravity the “inward curvature” of space? I’d certainly be willing to accept a logical argument, but just telling me the stuff I’ve spent decades reading is wrong, without explanation really doesn’t convince me. So now the space between galaxies is expanding and according to theory and measurements by COBE and WMAP of the background radiation, the over all universe appears “flat,” as gravity and expansion balance out. The argument being that inflation blow it up so large that it only appears flat, much as the surface of our planet appears flat from our point of view. So yes, it expands and contracts and the result appears to be an overall equilibrium. How can it be argued that “space itself” is expanding, if there are simply more lightyears, not expanded lightyears, between these galaxies??? From what I hear, the fundamental measure of space is defined by the speed of light. So what is this “vacuum” that light is measuring, as these galaxies move apart, so that light takes longer to cross this distance and thus is redshifted? Remember the proof of the expansion is the redshift of intergalactic light and yet it takes longer to cross this space, so we have one metric expanding, based on the redshift of this light and we can compare it to a stable metric, based on the speed of the very same light and that’s not contradictory??? The original reason they argued it was an expansion of space is because we appear to be at the center, but we are at the center of our view of the universe, so an optical explanation would make considerable sense. We accept gravity is equivalent to acceleration, but the surface of the planet doesn’t rush out to hold us on it. Did they really understand intergalactic optics 80 years ago, enough to say there isn’t something equivalent to recession? Patrice makes an interesting point, further up this thread, about light as point particles not being the most effective explanation and that is what needs recession to redshift. Meanwhile they have had to add inflation and dark energy, both of which constitute very enormous forces of nature, to patch further holes. If it is an optical effect compounding on itself, this would explain why redshift goes parabolic, without needing dark energy to explain the flatter increase of redshift closer to us. The result of this effect creates a horizon line for visible light, but black body radiation would still reach us from even further away and that would explain CMBR. Having been witness to people’s power of belief, I’m afraid I’m not convinced by certainty without reasons. Liam Ubert: “Whenever someone talks about the reality of time, a sceptic would be inclined to ask which clock is being considered? Indeed, how unfortunately it is! F1, the EVENT HORIZON, a total absolute frame. F2, the total MASS of this universe, which is unknown to us (UKU). F3, the total Space of this universe, again UKU. F4, the total passed time (age) of this universe. SR has its PLACE in physics, but No, SR plays ZERO role on all those absolute frames. While the APPEARANCE of the arrow-of-time depends on the eyes of the beholder, the ESSENCE of time (timeless to time process) is the agent which produces all those absolute frames. Your statement makes 100% sense for zillions physicist who do not read this webzine. But, it is wrong for you, as you were provided a better calculations for the CMB and many other DATA almost one year ago (https://scientiasalon.wordpress.com/2014/06/05/the-multiverse-as-a-scientific-concept-part-ii/comment-page-1/#comment-3158 ) at your own article about multiverse. It DIRECTLY addresses many issues of fundamental physics (especially the CMB) data with calculations (not talking talks). You avoided to discuss them at your article. I requested you to face those issues many times since and you dodged again and again. Now, this is the last chance for you to face those calculations. If you dodge again, please do not make the untrue statement (as you did today) on these issues anymore. For the multiverse issue, it is very simple. First, show us all that how THIS universe arose first; after all, we do know that this universe is real. Second, don’t say that the ‘First” is impossible, as someone has showed how this universe arose (by showing the ways of calculating the nature constants of this universe). Causality can be analyzed in a similar fashion. When I bring two magnets together and they stick together, did I cause their attraction? On a human level, yes. On a physics level, absolutely not. I manipulated nature and brought two magnets together. The forces of mother nature ‘caused’ the attraction. Ultimately, no ‘cause’ for these phenomena has been identified – things just do their thing. Does this contribution qualify as metaphysics? “But they also remind us that precisely what makes [mathematics] so useful and general — its abstraction from the particularities of the world, and specifically its inability to deal with temporal asymmetries (mathematical equations in fundamental physics are time-symmetric, and asymmetries have to be imported as externally imposed background conditions) — also makes it subordinate to empirical science when it comes to understanding the one real world. I don’t know enough about the science here to really address this analysis. Leaving the logical impossibility to one side, what sort of empirical evidence of infinite quantities would we expect? E.g., In a Bayesian framework can we say if they existed we would have certain empirical evidence? Or are we just saying we must have some empirical evidence to believe something may exist – even if we wouldn’t expect to find it? Sadly, I don’t know enough about the issue to understand what the author is saying here. In general I question how much more knowledge our empirical senses can be expected to bring us and the emphasis put on them. Science is not just sensing something. It is putting together theories based on what we sense. Sure if we see something contrary to the theory that can be fatal for the theory, but how much can we expect to empirically? I often wonder how much we would know if for example we had no eyesight and made our way by echo location. I think there would be several things about the universe we just don’t know and likely would never know about. It would only be through modeling and theory that we could understand how reality might work. How do we know we are not missing another “key sense” that is very critical to understanding how the universe works? If we think about how our senses came about it would seem quite likely that there would be little reason to develop all the senses necessary to fully plumb the depths reality. Joe’s comment reminded me of Neal Stephenson’s Anathem, where this argument (the only shared knowledge between sapients with different sense organs will be mathematical/geometric in nature) is used to support a particular (hilariously sense-of-wonder) form of Platonism. I’m often surprised that I haven’t seen any discussion of this book on philosophy blogs.